JPT manufacture and export a high quality range of Diamond & CBN Wheels which includes Resin Bond Diamond Wheels and Metal Bond Diamond Wheels. These are manufactured in compliance with set industry standards and are at par with international quality norms. Our range is widely catered to precious & semi-precious stones industry and mechanical industry. 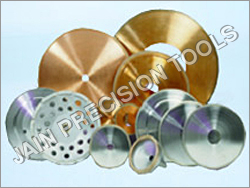 Metal Bond Diamond Wheels manufactured by JPT is used in numerous industries across the globe. For the maximum productivity and consistency, sophisticated metallurgical techniques and premium diamonds are used in the manufacturing of Metal Bond Diamond Wheels. Designed with varying degrees of hardness and abrasion resistance, these wheels offer maximum performance and long functional life. • Sharpening carbide reamers, drills, inserted tooth milling cutters, etc. Although metal and vitreous (glass-like) bonds are sometimes used in diamond wheels designed for grinding cemented carbides, resin (usually phenolic) bonds are preferred. Resin bonds are resilient, cushioning the diamond abrasive against shock that might cause gross fracture. And, since resin bonds are formulated to wear at the same rate as the friable diamond abrasive, new crystals buried in the bond are exposed when needed. As a consequence, resin-bonded diamond wheels generally remove material up to ten times faster than metal-bonded wheels and twice as fast as vitreous-bonded wheels. “Hardness” (wear resistance) of resin bonds is an important factor in diamond wheel performance. If a resin bond is too hard, the wheel will not be freecutting. If a bond is too soft, wheel wear will be excessive. 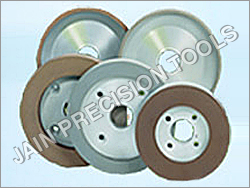 Grinding efficiency can be improved by matching the hardness of the wheel to the specific grinding job. Factors which determine the wheel grade (hardness) are contact area between the wheel and the work, wheel surface speed, wet or dry grinding, grade of carbide, etc. Basically, a grinding wheel is a toolholder. The tools are crystals (grains) of abrasive embedded in a bond or matrix, which is supported by a core that fits the machine spindle. In a diamond wheel, the abrasive is confined to the wheel rim. Increasing the diamond concentration of a wheel makes it act “harder” it wears more slowly. With more diamond crystals to share the work, less stress is placed on each crystal. The degree to which increasing the diamond concentration of a wheel improves wheel life depends on the mesh size of the diamond abrasive. Fine mesh-size abrasive crystals have very small surface areas, which makes it difficult for the resin bond to hold them securely. Premature pullout of abrasive crystals makes the wheel act softer and shortens its life. entire surface is concentric with the spindle within 0.0005 inch (.0127mm). If a diamond wheel frequently tends to lose its free - cutting effectiveness in service, operating conditions probably aren’t just right for that particular job. The wheel can be reconditioned by dressing. But the way the wheel is being used should be critically reexamined.